Our Christmas cards emphasise the colour and sparkle of Christmas. Each kit contains all you need to complete the card - perforated paper, backing paper, threads, needle, thread card, envelope, chart and full instructions. 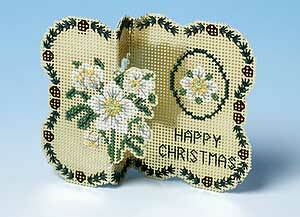 Where the design incorporates beads or metallic thread, these are also included in the kit. Worked on gold perforated paper, these Christmas roses bring a seasonal message. The card is 9.5 cms high.